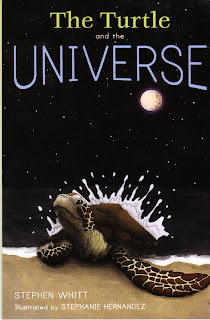 I read Stephen Whitt’s book “The Turtle and the Universe” because it seemed interesting, but mainly because I work with the guy and I thought I’d throw him a bone. Months ago, while attending a funeral, Steve and I spoke at length about the book writing process and the soon to be published book topic: turtles and science. I like science, but am not a big fan of turtles. They rank about 312th on my list of favorite animals between the meekrat meerkat and the sloth. I didn’t think that this book would interest me and I planned to slog through it for my friend. This book is as wonderful as it is enlightening. Meant mainly for the middle school science crowd, this book really touched me. A science book! Someone as simple as me would summarize the book like this: the universe went boom, some carbon when flying willy-nilly, the Earth got sucker punched by the moon, some stuff was bubbling on the sea floor, turtles cry as they abandon their kids on the beach and hopefully humans will get their act together and quit messing with our planet. Steve, instead, weaves a story using easy to digest science with the heartwarming, if not harsh tale of the sea turtle's life. It is a story about our far away past and our very near future. And it is all brought together in a very understandable way. It is refreshing to read a book that warns us against ourselves without being preachy. Or explains the origin of life without having to drag out a dictionary. It is a book about sea turtles and science, but that is the head fake; the story is really about you and me. This book is turtles all the way down. Please buy it. Read it to your nine year old. I’ve got mine on the shelf for Greg and Ann. Is this the Blogosphere? I feel weightless and my tastebuds are numb. Why don't you just buy and read your child the Holy Bible? They make children's versions and it has all the facts right in there. Ah, my kids are into non-fiction.